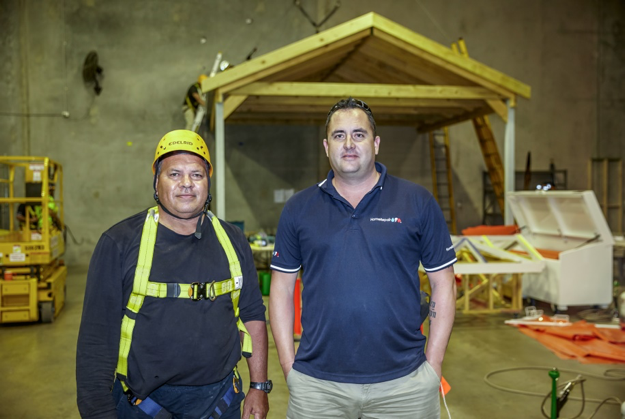 A group of seven roofers were first in the world to become Stormseal Accredited Installers, by completing Pinnacle Safety and Training’s one-day course, in Brisbane on 11 August. Stormseal’s Managing Director, Matthew Lennox, observed the training, which was held in Pinnacle’s facility for Working Safely at Heights, at Murarrie. ‘I’m thrilled with the training Pinnacle is providing,’ Mr Lennox said. ‘Through a tender process, we selected Pinnacle because of their professionalism, sophistication and commitment to high quality service. ‘Our team took great care in developing the comprehensive training package, condensing eight years of experience with Stormseal into a single day of hands-on learning. We’ve provided first-class equipment for the trainees to use and we have great confidence in Pinnacle’s skilful presenters. ‘By training expert Stormseal installers, we aim to significantly improve Australia’s response to severe weather, which is becoming more common. ‘Stormseal’s strong, polyethylene film is a great leap forwards from the flaps, gaps and failures of tarpaulins. It heat shrinks to weatherproof storm-damaged structures and stays put, promoting emotional, social and financial resilience in the face of disaster. ‘This training course should be the first of thousands, here and overseas, because Stormseal has applications in emergency services, the insurance building sector and the construction industry,’ Mr Lennox explained. The next course in Brisbane will be held on 15 September 2016. Training is also available in Melbourne and Sydney. Groups of 6 or more people can train at other times, by appointment. Additional educational resources can be accessed on the Stormseal website by those who complete the training. Stop tarping. Become an Accredited Stormseal Installer, before the storm.